In the Device Manager you might be wondering why “Microsoft ISATAP Adapter #3” appears with a yellow exclamation mark next to it or you might see this error: “Windows cannot load driver (Code 31)” when opening the properties dialog box. I found this on Windows 7 and the answer in this Microsoft KB article. You can safely ignore this error message. This error message does not indicate a problem with the adapter. The adapter will continue to work correctly. CUIx (customization files) is a new thing in AutoCAD 2010 replacing the CUI (legacy customization files). The best and safest way is to use the CUI command within AutoCAD. Second choice is using the API but if you are careful you can edit them in an XML editor like XML Notepad (not supported by Autodesk). The CUIx files is just a ZIP container (just like DOCx, XMLx and DWFx) so you can rename it to have a zip extension and you will be able to unzip its content. If you use for example 7-zip you can just right click and unzip the CUIx files directly. If you load a CUI file into AutoCAD it is automatically converted to CUIx. Here is for example the content of acad.cuix. The file contains several cui and xml files. This explains why the CUIx files makes the Ribbon and CUI work quicker than in AutoCAD 2009. Because the content is split into several files loading often is quicker than having to load the whole CUI. This also improves performance when you have the CUIx files on a network as the compression/decompression happens on the local machine and there is no need to send the quite large CUI (text based XML) files over the network. CUIx files also allows bitmaps (like BMP or PNG for icons) to be included and is improving performance. Resource DLL’s can still be used. But compared to having hundreds of bitmaps on the network having them in the CUIx is much better. Finally. The MNR files are still used by AutoCAD as the CUIx files are automatically converted to MNR when needed. SSMPropEditor 2.2 is now released. 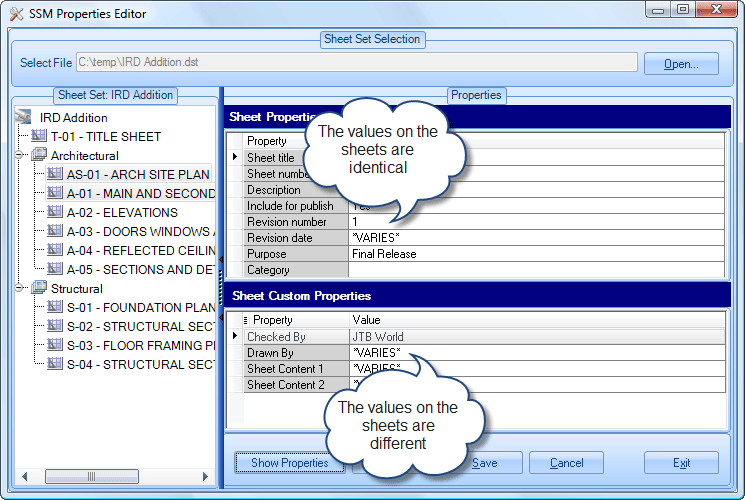 If you often need to edit properties on multiple SSM sheets this is the software for you. Free trial is available. SSMPropEditor is compatible with AutoCAD 2005 up to AutoCAD 2010 as well as all AutoCAD based verticals. You don’t even need AutoCAD to be able to edit and view the Sheet Set (DST file). If the software is not registered it acts as a viewer only (read-only) or as a launcher if you are an AutoCAD LT user, have the DWG TrueView installed or any other CAD application that is associated with DWG files. Right click on a sheet and open the associated drawing in your DWG application. SSMPropEditor is also localized into German. I got help with the translation within the program but used Google translate for the first release of the German Plansatz-Manager Eigenschaftseditor web page. I welcome any corrections wherever needed. If you have installed version 2.2 before the release it has been a beta version so it is recommended that you uninstall and download this new version. I found that a form that I had localized worked fine before running Dotfuscator on it. I used the form property Localizable set to True and Language to German. Eventually I found that by excluding the form item from being renamed by Dotfuscator it worked as expected. There might be other solutions but so far this has worked. Soon the first software from JTB World will be released in German. I found AcDataLinkUpdateOption via VBA object browser but not much more. UpdateAllDataLinks and GetDataLink are not there. The VBA reference says UpdateAllDataLinks is a method on the Table object. This is also the case with AutoCAD 2010. I got confirmed via ADN that these APIs have been removed but the documentation was never updated. ObjectARX or AutoCAD .NET API are the way to go. I also did try AutoLISP using (dictsearch (namedobjdict) "ACAD_DATALINK") and then entmod but there was a bug there that made it not work. The problem shows on assoc 302 where the value is duplicated when using entmod. Dictionary objects can be examined with entget and their xdata modified with entmod. Their entries cannot be altered with entmod. All access to their entries are made through the dictsearch and dictnext functions. Dictionary entry contents cannot be modified through entmod, although xdata can be modified. Dictionary entries that begin with ACAD* cannot be renamed. A practical example of this I found on designboom. See this example of radiator. More details here. Would be a fun project creating a program to do this in AutoCAD. More on space and plane filling curves here and the math behind. The new report application for JTB FlexReport is getting closer to a final release. The UI have been streamlined and more features have been added based on request from users. The old Excel application as report tool is not planned to be developed further. So if it is something you are missing in this new version it’s time to let me know. You are welcome to contact us for a free time limited trial. I got a question by email on how to close an AutoCAD drawing without saving and without issuing any question to save changes. Here’s my tip using AutoLISP. Just checking dbmod and if needed call Yes to discard all changes. This can be added to a toolbar as a macro or a command can be created based on it. This is a great example on how AutoCAD 2010 can be useful as a 3D application even for Revit users. Normally AutoCAD is used by Revit users for plain 2D work like details. Read about it on David Light’s Revit blog. It shows how a 3D form can be created with the new mesh tools and converted to solid and finally imported into Revit for further design work like adding walls and curtain walls. This surely gives more freedom for Architectural design as well as other kind of design work and it will be interesting to see how the new Autodesk 2010 portfolio will be used. This is a follow up to the previous post No VBA installed with AutoCAD 2010. Here’s some more information about the future of VBA and VSTA for AutoCAD based products. http://www.autodesk.com/vba-download will in a few weeks time have a FAQ about the future of VBA and VSTA. If you have any questions you want to be answered or addressed please add a comment below and I will forward it to Autodesk for consideration. This discussion group post has a reply from Eric Stover at Autodesk. We are offering VBA for download on our website - which will appear once the product officially ships. You can download the product and install and deploy it within your organization. Your VBA code should work just as before. Information on the longer term transition to VSTA is coming soon. Autodesk is working on a .NET developers guide (no release date yet). The COM interface will remain and work even without VBA installed. This is important to know if you program in AutoLISP and Visual LISP. One cool thing with VSTA is that both Visual Basic and Visual C# can be used as well as having a more modern IDE that is similar to Visual Studio. When you migrate VBA code to run for AutoCAD 2010 remember you might need to change the reference to point to to the AutoCAD 2010 type library acax18enu.tlb or the like. One error message you can get if you forget to do this is "Type Mismatch". Code like this one below needs to use 18 as well. One of the most welcome and big news in AutoCAD 2010 is the parametric functionality. In AutoCAD 2010 it is mainly to be used in 2D but to some extent it can at least drive 3D geometry as can be seen in this sample I created by only adding a few constraints. Below is an animated GIF file showing how the reciprocator works when dragging the magenta handle around. A reciprocator is also called ellipsograph because it the handle is describing an ellipse. Notice how the linear motion of the two green guides convert the motion to a circular or ellipse motion or the other way around the ellipse rotary motion is converted to a reciprocating motion in two axis. You will find that you cannot add constraints to vertical objects like Walls in AutoCAD Architecture 2010. Hopefully it will be possible in a future version or you need to use Revit 2010. The new Loch Lomond and Trossach’s National Park Headquarters is the largest green timber frame building in the UK. In addition some of the members are the biggest green timbers ever used in a timber frame construction measuring in at a massive 600mm x 650mm x 6.5m solid green Douglas fir. Carpenter Oak and Woodland Co. Ltd has more info and pictures. AutoCAD Architecture is used to engineer the 3D structure. by Randall S. Newton on the new AutoCAD 2010. Enjoy the reading. When Aish arrived at Autodesk, he was given the freedom to wander around the company and look at the various technologies and products available, to find the right technology to build Autodesk’s answer to Generative Components. He looked at Alias, Maya, Max, Mudbox, Inventor, NavisWorks, Revit ... and chose to base his new research project on AutoCAD. “There’s some interesting things going on with the old girl,” Aish told me. DevComponents Blog have the solution to Visual Studio Toolbox Not Updating With New Controls Solution. SmartPurger 2.8 has been released. It is working with AutoCAD 2010 based applications as well as it installs easier on both Windows Vista and Windows 7. SmartPurger can not only purge multiple drawings, SmartPurger can close dialog boxes that might stop the script processing and can also run custom script or AutoLISP files as well. When you have installed AutoCAD 2010 you will probably notice that VBA (Visual Basic for Applications) is not included on the DVD. Or you might try to run VBAIDE or load a DVB file. This dialog box will show if VBA is not installed. Soon time for VSTA (Visual Studio Tools for Applications) and this seems like Autodesk’s way to try migrate away users from VBA. Microsoft has stopped supporting VBA for some time now & it's not ported to 64-bit. Learning VBA is not the future. Via TenLinks Daily newsletter “more users of Autodesk software will have full access to the rich content presented at Autodesk University”. High class training for free. Revit Architecture Visualization Suite 2009 is the new package that includes all of these products. MADCAD is a web-based subscription service providing online access to an HTML format, fully searchable collection of building codes and standards from major content providers. MADCAD's online content includes over 7,000 codes and standards from ASHRAE, ASTM, CSI, IAPMO, ICC and NFPA. - Local code information including adopted model codes and state amendments. - Hyperlinked cross-references within books for fast navigation. - The ability to create custom book groups for quick access. - Building product manufacturers classified under CSI’s MasterFormat. MADCAD have a beta of eLibrary v.3.0 available now according to this press release. Andrey Lazebny has written in a lively joke manner this story that has been translated, edited and published by Nikolay N. Poleshchuk. It is possible to create a dynamic block in AutoCAD having multiple visibility parameters using AutoLISP and Visual LISP. Learn how to add new visibility parameters to a dynamic block already having visibility parameter, rearrange custom properties, access and use ACAD_EVALUATION_GRAPH and BLOCKVISIBILITYPARAMETER dictionaries, BLOCKGRIPLOCATIONCOMPONENT and more. On programming access to dynamic blocks from AutoLISP has the story as well as the source code. Below you can see a block with 10 visibility parameters. First Hotels plans to build a 25000 m2 hotel with 600 rooms and conference center close to Arlanda Airport outside of Stockholm, Sweden. Here is more on the project on Bjarke Ingels Group – BIG. In AutoCAD 2004-AutoCAD 2009-based products, there is a potential security vulnerability in the shared liveupdate16.dll file. This includes everything from AutoCAD LT 2004 to AutoCAD Revit Architecture Suite 2009. You better push this out to all users in your company.